Sienna Miller recently rocked the rose gold hair trend, and because it’s been seen in Hollywood, we all want a piece of the action. Lauren Conrad opted for a rose gold dip dye, Ellie Goulding went a more pastel / pinky shade of rose gold hair, and even Katy Perry has had a go at it. 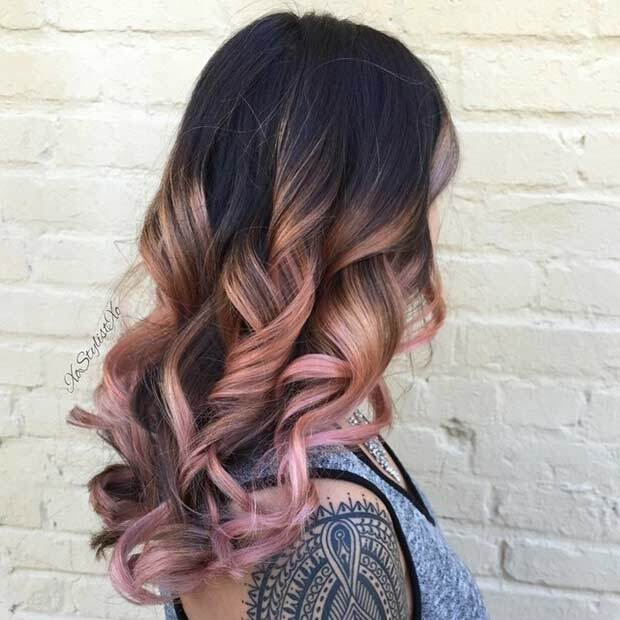 The rose gold balayage look is one of the easiest. You get to rock the newest on-trend shade without committing to the colour all over your locks. The spiral waves help to show off all the shades in your new ‘do, and it’s a super easy look for when you don’t want to mess around too much with heavy-duty, high maintenance roots. 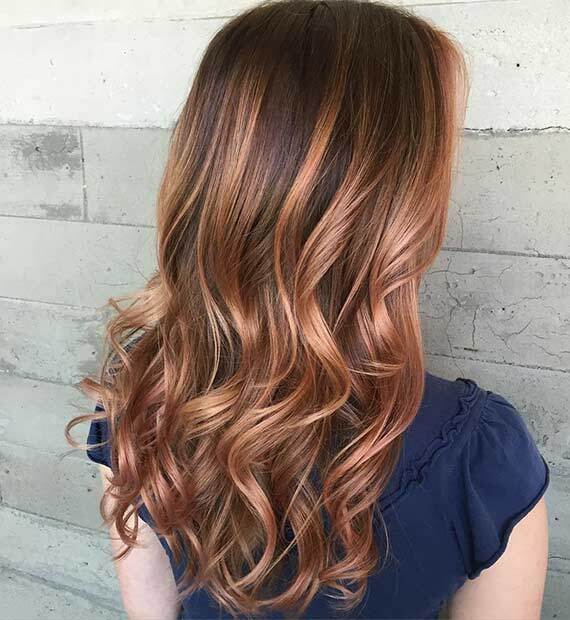 When you head to your hairstylist, make sure you ask for a ‘brunette to rose gold balayage’. Give it a couple of hours with a talented stylist and you could have a beautiful new look like this one. When you don’t want a balayage, why not opt for rose gold highlights? Highlights work more at the top than at the bottom like you’ll see with a balayage style, but they are more recognisable when you’re growing them out. Roots with highlights are harder to maintain than with the darker, more natural balayage dip-dye. The latter is also easier to achieve with a more natural, hand-painted finish. 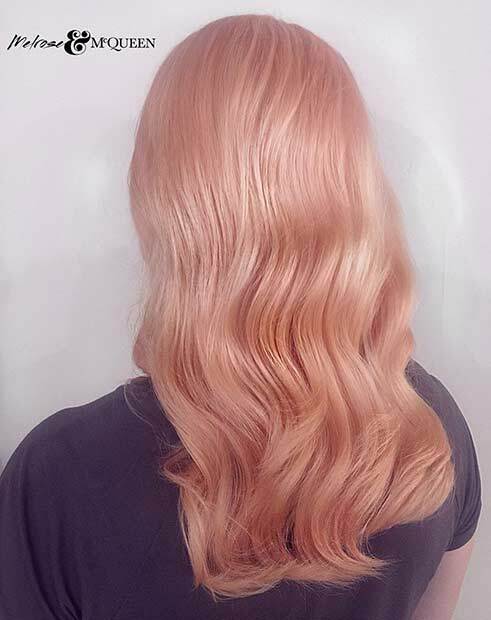 If you’re looking for an all-over rose gold look you should be aware that this colour won’t last as long as some of the other shades you may have worn. 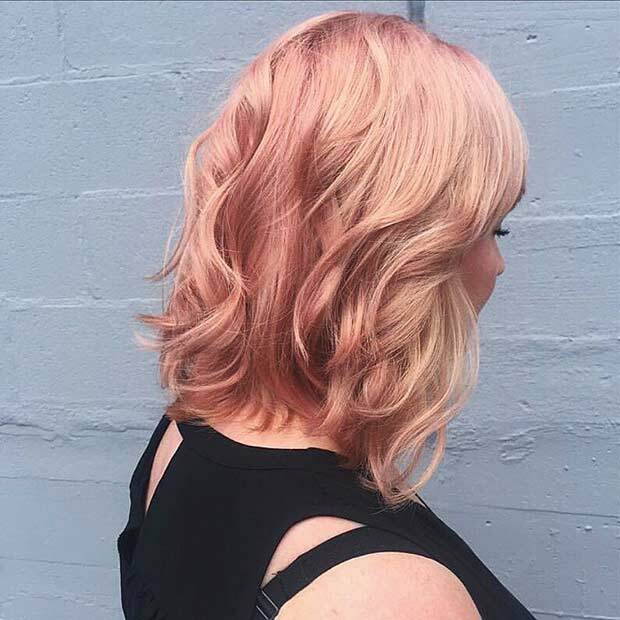 This rose gold lob is a prime example – it’ll fade a lot quicker. It’s a pastel shade which means it automatically fades much quicker. You’ll probably be looking at re-doing your shade every 5 to 7 washes. This will all depend on how well your hair takes to the new shade. Before you go ahead and put your rose gold hair color ideas into practice, do your research. If you do, you’ll learn that you should be applying deep conditioning treatments to your hair for at least three or four weeks before the appointment is booked. That bleaching and lightening won’t be good for your hair. By making sure it’s in good condition to start with, the negative effects will be minimal. The healthier your hair is when you start, the healthier it’ll look when it’s finished. Everyone knows that bad-condition colored hair just looks awful. Do your prep work, ladies! Just because you have crazy curly hair doesn’t mean you can’t play around with color too. In fact, there’s nothing we love more than this curly style of rose gold, one that some people might find too unmanageable. Luckily we’ve got some tricks up our sleeve… Coconut oil is great for everything these days. If you apply a deep-conditioning coconut oil hair mask to your hair BEFORE you decide to have lightening treatments, you’ll find your hair will be much more manageable afterwards. Coconut oil is now a beauty staple as far as we are concerned. 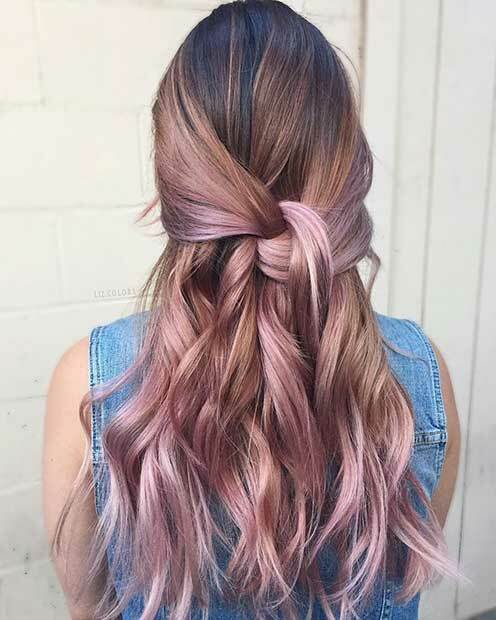 Dark hair looks amazing with a contrasting pastel shade, and this rose gold ombre on dark hair is literally #hairgoals! The good news about this is that you will only be lightening the ends of your hair. The even better news about this is that it doesn’t matter when your roots grow out. In fact, in many cases, the roots just add to the appeal. Have a look at the celebrities these days – they’ve all got dark / alternate / contrasting colored roots these days. It’s the ‘in’ thing! Just because Emma Roberts has a bright shade of rose gold hair doesn’t mean that you need to. Sometimes you may need to play around with new shades and tones, especially if you have a particular dark or light complexion. You should be working with your hair colourist to find a shade that matches your skin tone, not one that means you need to slap on a few extra layers of makeup just to make it work. This is quite a light color of hair to pick, and with a light complexion you may find that you look a little washed out. If this is the case for you, warmer tones and slightly deeper shades might work better. This look is perfect for Fall – subtle, discreet, beautiful, and combining all our favourite colors of the season – russet browns and reds with caramel blondes. 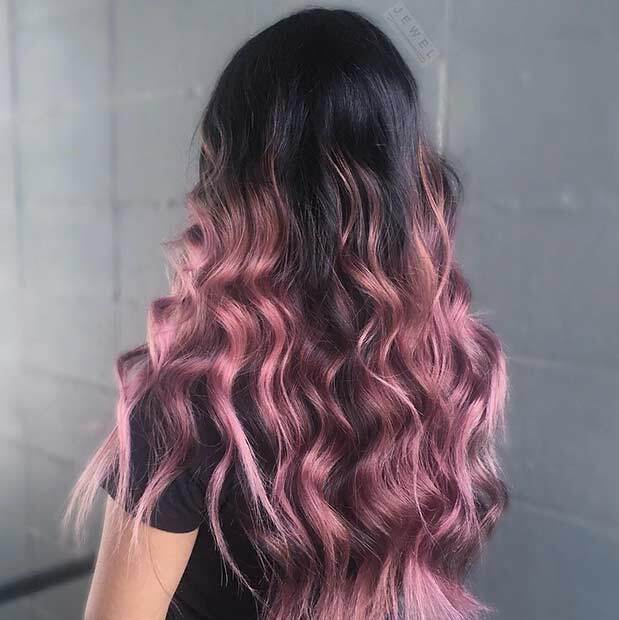 This might just be the ultimate September / October shade… If you want to recreate this look, ask your hairstylist for a subtle balayage rose gold blend at the bottom, leaving the roots natural and dark. When your natural roots come through, they won’t be so obvious (especially if you have darker hair anyway), and it’s a style that will last. You can get away with leaving it an extra couple of weeks between salon appointments. 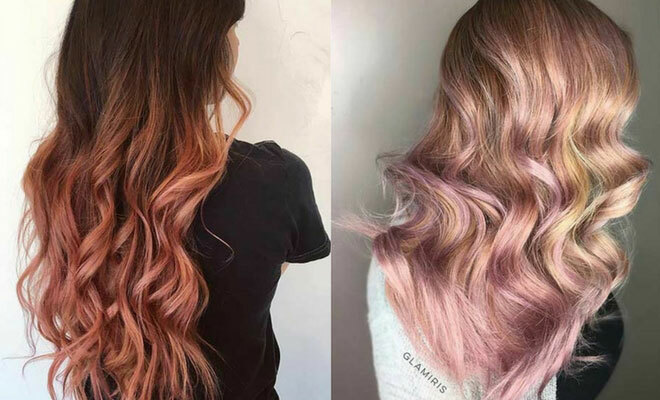 Rose gold hair is beautiful, so it’s no wonder that every celebrity is jumping on the bandwagon. Incorporating mixes of red, blonde and pink together has never been so much fun. Although you should probably be wary of the ginger-factor when it fades. 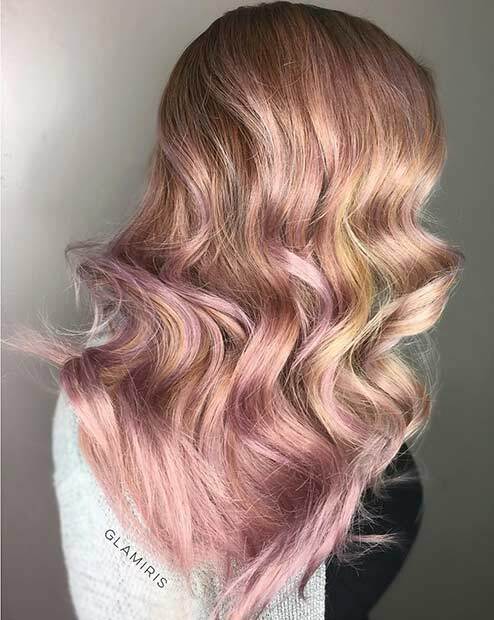 Peachy-pink shades will look more orange as they lighten and fade, although there are things you can do to stop the fade from happening so quickly. Starting with a good colour, and a good colourist, is always a good idea. You can top the colours up yourself at home, but getting that initial perfect first look is often the hardest part. 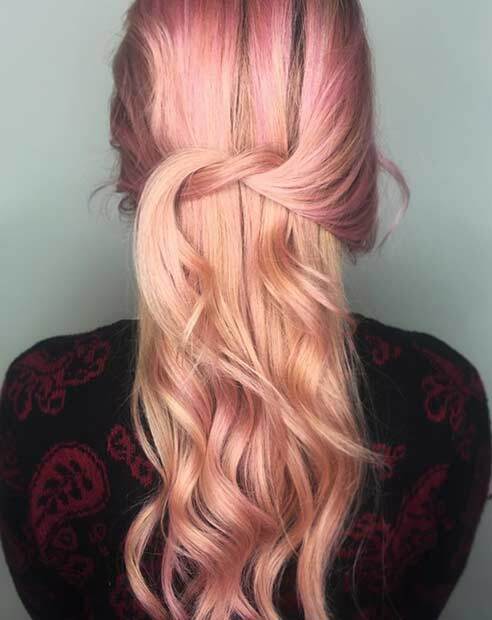 Blonde and rose gold hair is the perfect combination as far as we are concerned, and blonde hair is actually the perfect base for any pastel pop. This peachy-pinky one is an absolute winner, natural enough to fit in, but beautiful and bold enough to stand-out, all at the same time. 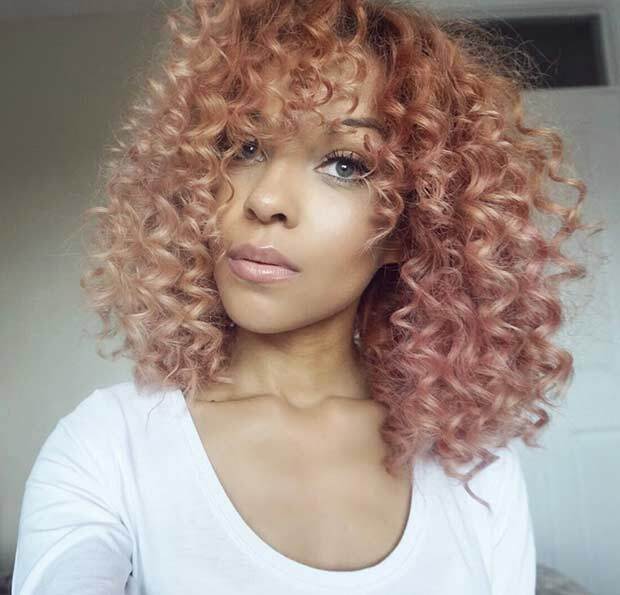 Fading out this rose gold look is easier when you go for a more pastel-pink than red/orange tone. We would also suggest using a silver shampoo as you’re trying to fade it out too – it makes the ‘pastel-ness’ last a little bit longer. Do I need to do anything else? ?